Beautifully decorated and very comfortable, sun-filled Village home. Fully equipped gourmet kitchen, with 4 bedrooms, 3 queen and 1 with twin beds, and 3 full baths. Private yard with pool and spa and 2 large furnished bluestone patios. Beautifully landscaped property with on-site parking. 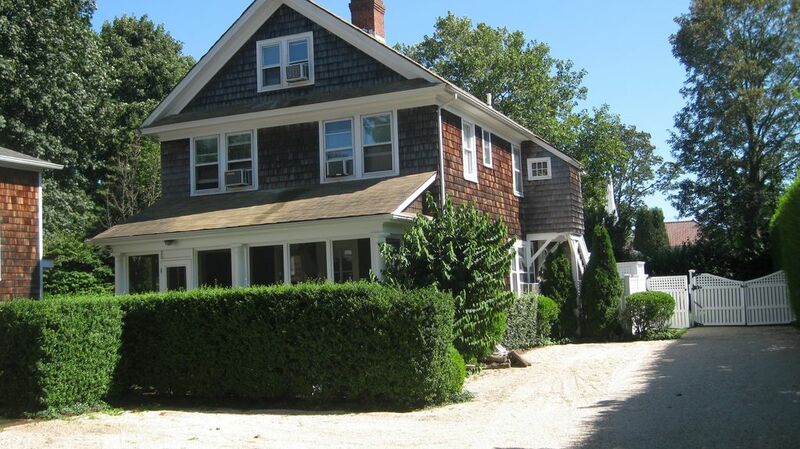 Walk to everything, 1 block to the terrific shops, great restaurants and cultural events of Southampton Village. Bike or walk to beach and train, short drive to Jitney. My girlfriend and I rented this house with another couple for a long weekend in Southampton. The pictures on the HomeAway site perfectly capture this unique, lovely house. Everything was EASY - the owner was waiting for us when we pulled up in the driveway and gave us a thorough tour - we instantly felt at home. The four upstairs bedrooms fit us perfectly, and would be great for a family or small group of friends. The house was well-appointed - we cooked breakfast every morning and loved the well-equipped kitchen. We used the outdoor grill for cooking dinner and enjoyed the lovely patio. The pool is of course a highlight, with both an excellent spa/hot-tub and a LARGE heated pool w/ outdoor shower. If you have kids, the basement is stocked with pool toys, and other fun stuff. Wifi was reliable, TVs with cable are located throughout the house. Last but not least - the location is a big plus. A 3-minute walk into town makes shopping easy, and accessing the beautiful beach only takes a quick bike ride or drive. Anyway, I am a discerning renter from NYC and couldn't find any fault here - I'll definitely be returning! My family of six spent a month in Southampton and cherished every moment staying in this lovely home! It was not only decorated beautifully with a perfectly manicured garden, it was also in the most convenient location. We could walk to town, ride bikes to the beach (which were supplied by the owners), or just relax in the peaceful and very private back yard hot tub and pool. The outdoor shower was a huge bonus! Besides the house being immaculate, it had books and games and an amazing outdoor grill! Neither my husband, myself, nor my children ages 16, 12, 10, 7 couldn't have asked for anything more! We are looking forward to another fabulous vacation this summer!